Powerful, under-rated at 140 W/ch @ 8 ohms. State of the art high-end D/A converters, 6 assignable digital inputs (3 toslink, 3 coaxial), 2 digital outputs (1 toslink, 1 coaxial), ability to decode and drive 7.1 channels (5 channel amp built in), THX, Dolby-EX, DTS-ES, HDCD decoding (for the music lover), AC3 RF decoding for the video disc collector, state of the art touch screen completely programmable remote, tape/processor loops for up to 4 sources, pre-out/main-in RCA connections, assignable 7.1 channel discrete analog input for multi-channel DVD source or external D/A converters, 3 component video inputs, component video output, 5 composite and s-video inputs, composite and s-video outputs and much, much more. No HDMI inputs or outputs, original MSRP $4,500. Weaknesses - No HDMI however if your listening to analog you will be surprised. If you ever see one up for sale... Grab it. Most folks who own them, do not let them go! Before purchasing this receiver, I had heard all of the accolades, but thought there was little to no difference in the sound of the Marantz SR-18U that I owned versus the SR-14EX. Boy was I wrong! Big differences... lower noise floor, much wider sound stage, and tighter, deeper bass, and much more clean power. Even though it doesn't have all the latest codecs, it will put to shame most any of the new high end receivers in terms of sound quality. This thing is well built and it feels like it, as it is very heavy, and another difference has the copper chassis. If it has the Champaign finish, you just want to look at it. Hook it up to one of the latest Oppo model players, and you can't go wrong, Plus you can use the Oppo as a hub for all of your other equipment. The Marantz SR-14EX will not disappoint. Silky smooth, and powerful when needed. You hardly ever see these up for sale. Grab one... you will not regret it~! available speaker power, exterior look, quality of the preamp section, nice digital inputs and outputs available, adequate component inputs and outputs. the headphone output is very good to excellent . the digital section of the receiver decodes HDCD which is a kick to see decoded from a ripped CD coming through a SqueezeBox to the receiver. This is one heck of a great sounding two channel system, let alone the sound of the 5 channel system. internal battery for holding settings must be replaced after many years or any interruption resets the setting, which is an irritation. this receiver does not have HDMI nor DVI video connections. (but I say, big deal, this is a great receiver) it also does not have the latest encoding standards for digital sound output for a number of modern lossless multi-channel sources. BUT, you can pipe in multi-channel through the analog inputs through the receiver from a Blue-ray player with a good analog output capability and this receiver will still do it all. if you do need full 7 channel sound output, you will have to add 2 good quality single channel amplifiers to this receiver. Built like a tank; very heavy. Very good sounding receiver with all the features to enjoy today's music and movies. I got this SR-14EX to replace my SR-19 which has been worth every penny since I owned it. Sound quality is similar in these receivers though the SR-14EX has more punch in the lower frequencies. One must own the SR-14EX in order to appreciate it - copper shields all around, anodized aluminum top and side panels, Marantz didn't hold back on anything in its design. Having two more channels of amplification is just not possible considering how full this 60-lb beast already is. I suppose it can be done but not without sacrifice. The SR-14EX works very well with my Sony DVP-S9000ES DVD/CD/SACD player. I love the sound of this Marantz and I am sure I will enjoy it for many more years to come. Musicality, overbuilt capacitors = excellect kick bass, overbuilt powersupply and output stage = silky smooth (almost dripping) sound imaging - for a non-tube unit anyway, and even then only a really nice tube unit would probably sound sweeter. Super value in today's market. No saving settings feature if the power dies or if unplugged for a week. It's heavy (58lbs), mostly due to the robust transformer. Rather plain looking, in black anyway. The multi-room functioning is also difficult to understand. Only one sub output. The remote is heavy, awkward and dated compared to new aftermarket stuff. The volume dial doesn't have that silky smooth weighted feel of some other high quality units I have used. All the good things you have heard about the 2-channel sound quality produced by the SR-14EX receiver are correct. I have looked at almost every integrated surround amplifier available on the market but before I went to Sunfire separates I decided to try the SR-14EX because of all the good things I heard about it. Context: My system is comprised of a very high end Sony cd player and 15 year old British made floor monitors (you know, the old school ones that produce sound images that literally "hang" in mid-air). The stereo musicality of the SR-14EX is the best I have heard from any solid state integrated unit to date. By physically turning the volume dial to 8/10 I can't determine if it is the limitations of the receiver or my speakers that begin to lend to the deterioration of sound quality. This unit is definately not overrated at 140 watts RMS like so many others are. I can't wait to hear what this receiver does with my top of the line B&W center channel in 5.1 or 7.1 surround configuration - but alas, all that stuff is packed away until the move is made and I can determine how I want to set up the new room everything will go into. Listened to many A/V units, but only owned a DSP-A1. Sound quality, home theater experience. At two years old, you can get unbelievable quality at this price. I'm guessing you'll have trouble beating the sound at the price I paid. Tons of hookups and easy set-up. For what I paid, not a one. I just got this for a steal on e-bay. This thing is built like a tank (60lbs) and it reeks of quality construction. The unit was the flagship unit two years ago and was crammed full of audiophile upgrades. I was replacing 10 year old mid-fi equipment and the sound this thing produced told me just how little I knew about audio equipment. When I upgraded to my B&W speakers, I was that much more impressed. The sound is unbelievable, the remote is a bit daunting at first, but for anybody that has ever worked a computer, it won't produce a stroke. For now, I'm only using as a 5.1 system, but I have the option to upgrade to 7.1 with an external amp as the it has the outputs to support 7.1. Powerful. Clear sound. Strong construction. I received the 5200 control, that's a big plus. Little tick sound (almost inaudible) when changing volume during a very quite sound passage. A Little pricey. Great sound. Powerful. Beautiful design. The sound is very, very clear, I was amazed about that. It lack a bit of bass with my paradigm Studio 80, but I'm getting a Velodyne sub to check if I can feel the empty the Paradigm's don't seam to fill. Of course the speakers are main towers not meant to deliver too much bass. Lots of connection options in the back panel. Chance to bypass the front amp, send it to the surround back and put your own monoblock for the main channel. Actually this is the recommended way to have a 7.1 system. Great and strong construction, this unit is really heavy. I don't liked too much the pre-programmed equalizations it provides, I really liked much better using tone controlled stereo. Don't tried too much source direct. Never used personally an A/V receiver before. 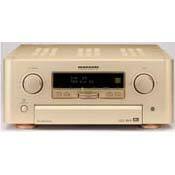 I owned a couple of legacy (70's) Marantz system, great products. High amperage, easily pushes the 100's to create an open and airy soundstage without breathing hard. So quiet that certain musical passages can scare the heck out of you if you're not expecting them. No DD Prologic II, only 5 amplified channels. But that's all I need. Incredibly built product. No corners were cut here. Sure, it doesn't have all the bells and whistles that some more current models do, but what it does do, it does oh so well. Hooked up to my Paradigm 100 v2's the music washes ove listeners like velvet. So clean, crisp and unadulterated. Kick in the center channel and surrounds with LOTR cranked and the lights low, and the audio carries you away to middle earth. Hand-built with hand picked components. Marantz did good with this one. I bet there are a few more out there that can be had for a very good price. Oh, and the remote is a pure work of genius, though a bit hard to program at first.